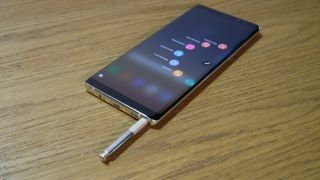 You might not be expecting the Samsung Galaxy Note 9 for at least a few months yet, but according to the latest rumor it could be announced as soon as late July, just over two months from now, then go on sale in early August. That would be a month earlier than the Samsung Galaxy Note 8 was announced in 2017, but according to ‘industry sources’ speaking to the Korea Herald, Samsung is speeding up its schedule, in part because sales of the Samsung Galaxy S9 apparently haven’t met expectations and in part to get out ahead of the iPhone XI. The sources claim that Samsung began building 6.38-inch OLED panels for the Galaxy Note 9 in April, which is apparently two months earlier than usual, but despite that they say the launch of the phone probably won’t be more than one month earlier than normal. It’s not just the Samsung Galaxy Note 9 that could launch early though, as apparently the launch schedule for the Samsung Galaxy S10 has also been changed, with the phone potentially being announced at CES 2019 in January. The Samsung Galaxy S9 for comparison was announced in February of this year. But even if the Samsung Galaxy S10 does debut in January, February might not be devoid of new Samsung flagships, as the sources also claim that this might be when we finally get Samsung’s long-rumored foldable phone, currently known as the Samsung Galaxy X. Supposedly the flexible display panels may be ready by around November, with it then likely taking two to three months to assemble the parts. It is, of course, worth taking all of this with a pinch of salt. While it’s not out of the question that Samsung would push up the launch of its next three flagships - and this isn’t the first evidence we’ve seen of an early Galaxy Note 9 launch – it’s still all just rumors for now, so don’t be surprised if you’re still waiting until September to get your hands on Samsung’s next flagship.